Those were the days, the flaming half of the 80s, just when Metal began intensifying its figure around the world with numerous heavier jamborees from the pits of hell. However, this band in question, didn’t seem on wishing to enter the belly of the beast and extreme their efforts and acumens, and remained true to the early roots of the genre along with varied portions of newly bred and upgraded genres, displaying proto Power Metal attributes in the alley of early QUEENSRYCHE and CRIMSON GLORY, following their post-NWOBHM values margined with IRON MAIDEN. XCEL, once emerged from Port Arthur, Texas, a long distant memory of the past, a band that wished to elevate their status but like many didn’t survive for long, leaving a recollection shard with a debut release, which was originally independent with the entire cost rates accounted for the band and not their label. 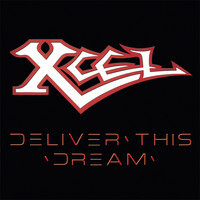 XCEL shipped away “Deliver This Dream” back in 1986; Arkeyn Steel Records chose to honour this old group with a reissue of this one time deal in conjunction with two extra 7” version of two of the band’s supposed hit tracks. For all intents and purposes, nothing was really earth shattering about this “Deliver This Dream”. Surly it has its thrills, laying down the magical roots of traditional Metal and old NWOBHM constructive songwriting, but I felt as if a weaker link was dragging this album a step down in comparison of what it could have been. As a fan of traditional Metal, one of the prime impressions out of this kind of music is the frontman. Kevin Luke delivered the notes with elegance and grace, this guy had quite a voice back in the day, probably still possess the talent to produce wonderful chants, but I will stop there. In my view, Luke seemed a bit too angelic and agile for this band’s music. It is like letting an AOR frontman of a sort to lead a Heavy Metal, and in the case of XCEL it wasn’t that far. There were a few occasions where Luke massed a Don Dokken character while showcasing a toughed up attitude, but his mid / high range just seemed odd with the band’s musical deeds, not that XCEL sounded that heavy in the first place. So yes, Luke served as the album’s scrawniest link, but still I liked his voice pattern as a whole. As for the album’s music, it felt like a surge of power, a haunting build-up in the near power station ready to explode, hard to stand by and watch the flames rise; you would want to join them, especially when it comes to the lean and mean lead guitar fretwork of the dual axmen at work. The rhythm riffery was solid, mixing it up with both American and European flavours, well written and arranged. The slick killer “Teaser” and epic MAIDENish “Last Ride of Ichabod Crane”, surprisingly the album’s winning singles won me over, and you thought that I assumed they were earlier on the previous paragraph. On the other hand, “Beware the Night” also let my mind wonder into the heavier corners of Metal but with limits, sadly that Luke lowered the intensity a bit though clinging to great high end pitching. No doubt that reissuing albums that weren’t considered as classics, is a virtue that should be kept and preserved, therefore continue. XCEL didn’t reach greatness, but they were somewhat close to it. Back in the day plenty of bands died out, releasing only small tokens of their legacy, but who said that no one can live the memory in the digital age? Go ahead and check these guys out.